Dezeen Awards entries close in 10 days! Here are answers to 10 key questions that will help you prepare your entry to the world's most prestigious awards programme for architects and designers. 1. 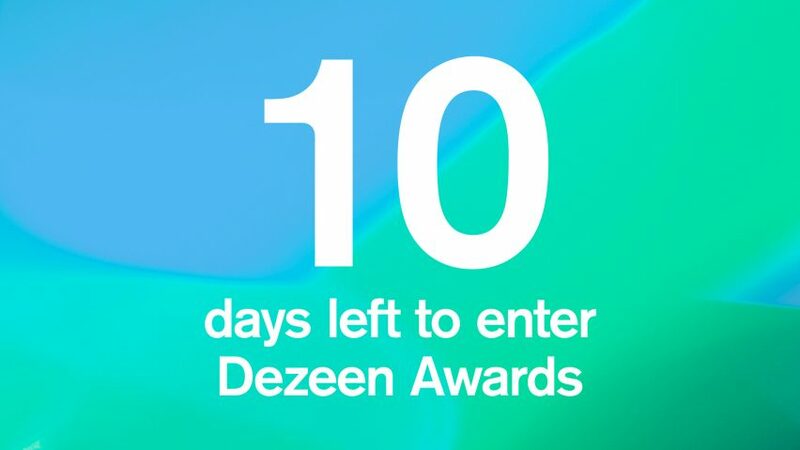 What is Dezeen Awards? Dezeen Awards is our new annual awards programme. It will identify the world's best architecture, interiors and design, as well as the studios and the individual architects and designers producing the most outstanding work. Dezeen Awards will be the ultimate accolade for architects and designers around the world. 2. When is the deadline? The final entry deadline is fast approaching! Entries must be submitted by midnight UK time on the 30 June to be considered. 3. How do I enter? To enter Dezeen Awards 2018, go to the enter now page and create an account. You can then enter as many categories as you like by completing the entry form for each category entry. We have made the entry process and simple as possible, so it won't take you long to complete. 4. What are the categories? There are 30 categories that you can enter: 10 each for the sectors of architecture, interiors and design – the core areas that Dezeen covers. In each sector there are eight project categories and two studio categories. See the full list of categories to find out which are most suitable for you. 5. What are the Ultimate Dezeen Awards? Ultimate Dezeen Awards will be awarded to individual designers and studios creating the most outstanding work in their sector. These awards are for the cream of the crop and their announcement will be the highlight of the awards ceremony! There will be nine Ultimate Dezeen Awards in total and they will go to the the best architecture, interiors and design studios of the year in both the emerging and established studio categories. They will also go to the overall best architecture, interiors and design projects of the year, selected from the eight project categories in each sector. 6. How expensive is it? There are lots of design awards programmes out there, but Dezeen Awards are one of the most affordable of all. Our entry fees have been set as low as possible to encourage entries from every type of studio around the world. There are also reduced rates for individuals and companies with ten employees or fewer. 7. Who are the judges? Dezeen Awards 2018 will be judged by what could be the highest-profile jury of architects and designers ever assembled. Our 75 experts include architect David Adjaye, interior designer India Mahdavi, designer Thomas Heatherwick, designer Benjamin Hubert and set designer Es Devlin. 8. What are the entry criteria? › Beautiful: does it look amazing? We know that beauty is subjective but our judges will be looking out for aesthetic rigour, good detailing and good use of materials. › Innovative: does it incorporate original thinking or address a problem in a new way? We don't mean that every entry has to reinvent the wheel but we will be looking for evidence of fresh approaches and new ideas. › Beneficial: is it useful and considerate to both people and planet? Your project doesn't have to set out to save the world but it should show respect and consideration for both users and the environment. 9. When and where will the winners be announced? It's a secret! The Dezeen Awards ceremony will be held at a landmark central London building on 27 November 2018. More details will follow soon, but trust us, you will be impressed! 10. What about the trophies? Each winner will receive a unique trophy designed by Dutch design studio Atelier NL, made from London clay. "To make the awards from London clay, where Dezeen is based, is a very beautiful way to connect people, place, earth, and design," said Atelier NL. We thank Dezeen for giving us this great opportunity."